With more than half of the graduates having earned college credits, 20 inducted into the National Honor Society, and 12 having volunteered more than 100 hours of individual community service, the Connecticut River Academy (CTRA) Class of 2014 had much to be proud of. The honor most frequently mentioned during the graduation ceremony on June 17, however, was something no one else will ever be able to claim: these students were the first to complete four full years in the CTRA program. In her emotional address, senior speaker Erica Beavers stated, “We are the pioneers. We set the standards.” This was the class that chose to leave the safety of their former schools back in August of 2010 to take a chance on a different kind of future for themselves at the environmentally-themed magnet school. Several speakers spoke wryly of “The Sandbox,” the original accommodations for CTRA, “a hallway with classrooms to the left and classrooms to the right,” as one called it. 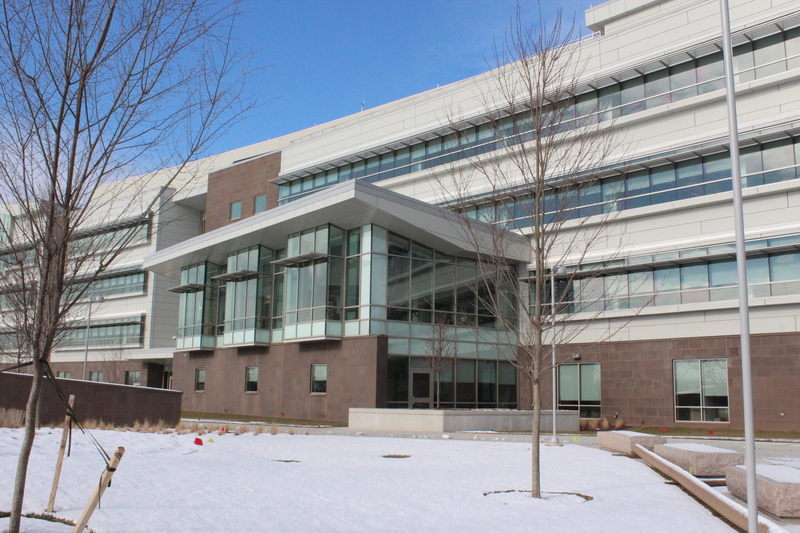 That picture changed dramatically when CTRA moved into its stunning new home along the banks of the Connecticut River on the Goodwin College campus in East Hartford. With facilities and equipment to support the school’s programming, the move heralded a new day for the students: “a world of infinite opportunities,” Beavers remarked. Dadona thanked Scheinberg for his vision for the Academy. She spoke about how the students and faculty had grown along with the school, calling out incidents that were both humorous and moving. She took a moment to reflect on her own growth at CTRA and thanked the community for teaching her lessons of patience, understanding, and flexibility. What better place to celebrate Earth Day than at our own Connecticut River Academy! Following is a write-up from CTRA student reporter Lydia Griffin. On Friday, April 25, the Connecticut River Academy held its second annual Earth Day celebration. CTRA students were given the opportunity to experience several environmentally themed events, such as a career fair, planting, riverside cleanup, and a buffet filled with fresh ingredients. The goal of the day’s events, in the words of main coordinator Ms. Saulis, was to “empower students to make informed decisions about…[their] health, nature, and quality of life.” With this celebration of Earth Day, CTRA aimed to make students more aware of the choices they can make to improve themselves and their environment. To that end, the Connecticut River Academy invited many organizations to take part in its first “career fair.” Over a dozen local organizations were given booths, which lined CTRA’s second floor hallway. Students were given the opportunity to learn about organically grown, sustainable food sources from the CEO of FreshFarm, the importance of maintaining the delicate ecosystem of Connecticut River by a River Steward, and the growing advantage to using environmentally friendly building techniques by a spokeswoman for Living Green. The town of Portland’s geographical survey taught students that acknowledging the environment was key to public safety, while East Hartford’s Public Health Department informed students about the negative effects of polluted drinking water that the Public Health Department protects citizens from. Goodwin College’s own environmental department was also present at the career fair, reminding students that environmental studies are not simply theoretical and that students could very well make a career out of protecting the environment, if they so chose. Outside, students could involve themselves in activities like planting new trees or cleaning up the litter surrounding the nearby riverbank. With the help of teachers Ms. Morales and Ms. Pereira, as well as Dan Connelly — an environmental science intern from the University of Connecticut — students planted the Connecticut River Academy’s first annual Earth Day tree, a beautiful sugar maple. CTRA senior Sonsherae Owens coordinated the creation of vertical gardens out of palettes. She’d been instructed in the planting technique during her time in the Summer of Solutions program; she did a wonderful job sharing her knowledge with fellow students. Students were also able to take part in a riverside cleanup, which was overseen by Mr. Metler. By the end of the day, CTRA students had managed to remove a large pile of trash from the riverbanks. Both activities helped students not only get in touch with their surroundings, but also improve the environment around their school. Other activities included an environmentally themed scavenger hunt, led by Ms. Keeney and Ms. Minor, and a set of games coordinated by Ms. Haggerty. Finally, after taking part in the career fair and outdoor activities, students could travel to the cafeteria, where a buffet of fresh, non-processed food could be sampled. Students from CTRA’s Food Systems class were involved in the creation of this buffet from beginning to end; they chose which meals would be served and helped Mr. Kilgus with the creation of the meals. While waiting for their food, students had the chance to transform regular river rocks into pieces of art using paint and decorate a banner using paint-covered vegetables. Both of these activities allowed students to take everyday items from nature and use them to create beautiful works of art. Reception of the celebration was overall positive; the combination of activities and food managed to hold the interest of even students who had no previous interest in environmental subjects. For example, Ray Mitchell, a freshman at Connecticut River Academy, “found the water [sanitation] booth interesting” and “had fun” during the festivities. Although she is not interested in pursuing an environmental major at this time, Ray — like many students at CTRA — nonetheless found the Earth Day celebration to be engaging as well as educational. This Earth Day, students at the Connecticut River Academy learned more about their community, improved their surroundings, and had fun while doing it. During a morning ribbon-cutting that had the youthful energy of a pep rally, Governor Dannel P. Malloy urged Connecticut River Academy students to set a high standard for those who will follow in their path. 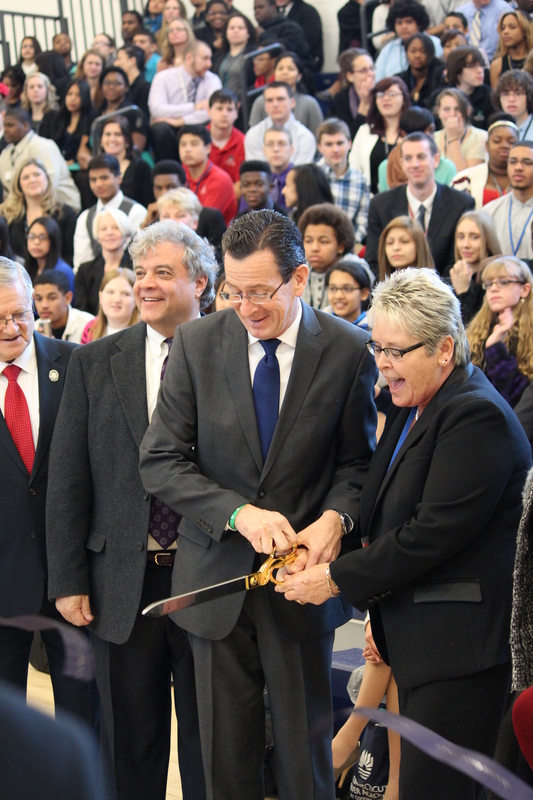 Governor Dannel Malloy and Connecticut River Academy Principal Linda Dadona cut the ribbon on the new school. Goodwin President Mark Scheinberg stands nearby. “You have the opportunity to set the tone, to make sure that each student that follows you understands how high the bar has been set, how much is expected of students who go to this school and how much will be given back by them to the greater society because you, this first class, set the standard,” said Governor Malloy, speaking to a crowd of over 500 students, teachers, and guests on Tuesday, January 7. The governor was one of many people on hand to formally open the new Connecticut River Academy at Goodwin College, a 105,000 square-foot, four-story magnet high school located on the College’s River Campus. Though the school has been open since 2010, it has existed in multiple incubator locations, including the College’s main building, while work progressed on a permanent home. The three-and-a-half year wait came to an impressive conclusion for the students, teachers, staff members, and administrators with the completion of the $57 million building. The school, located at 9 Riverside Drive, incorporates the Connecticut River and the surrounding environment into its design and curriculum, with a habitat room and “green roof,” project center, numerous high tech laboratories, and oversized windows. The building’s amenities also include a digital music lab, fitness center, and a full-size gymnasium. The latter served as the setting for the ribbon-cutting, where the entire school celebrated a new beginning. 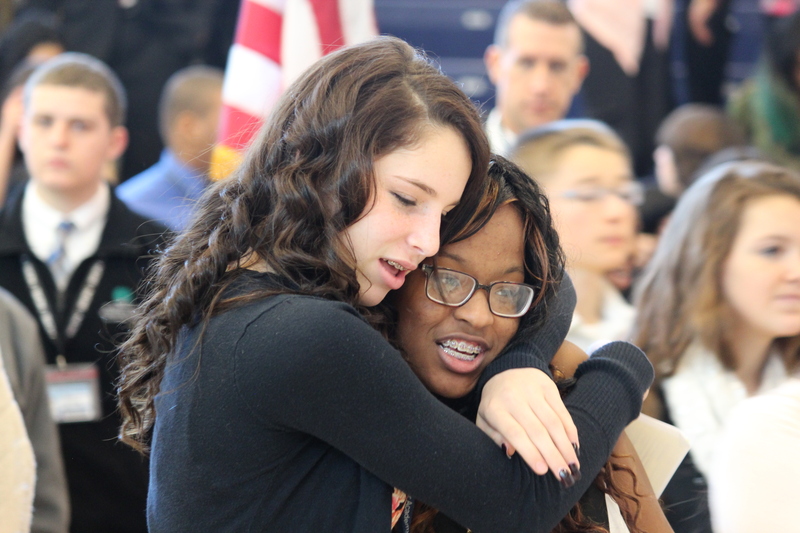 Ninth graders Saige Grace-Lange and Nakia Junor share a hug as they celebrate a permanent home for their school. Dadona has been principal since the inception of the Connecticut River Academy. Many of the teachers have also been there since day one, teaching out of modular classrooms as concepts for the permanent school took shape. The first graduating class never got to set foot in the school as students, but many of the grads were back on Tuesday to celebrate with their former peers. Upon arriving at the school during the morning, the students were given the literal red carpet treatment, walking the new corridor like celebrities while teachers and staff members snapped photos as paparazzi. Many students and teachers dressed up for the occasion, marking a classy debut for the school. In his remarks, Governor Malloy urged the students to make the most of their educational opportunities and congratulated them on their decision to attend the Academy. As a magnet school, CTRA is part of the state’s attempt to solve the educational challenges faced by many of Connecticut’s cities. Goodwin College built the Academy, as well as two other new magnet schools already open or scheduled to open this year. “If you take care of business, if you become well educated, if you get the kind of job that you want to have and makes you happy, and if you give back to community, you will live a most rewarding life,” Malloy said. The governor also took time to recognize every faculty member at the Academy and thanked them for their service and dedication to education. 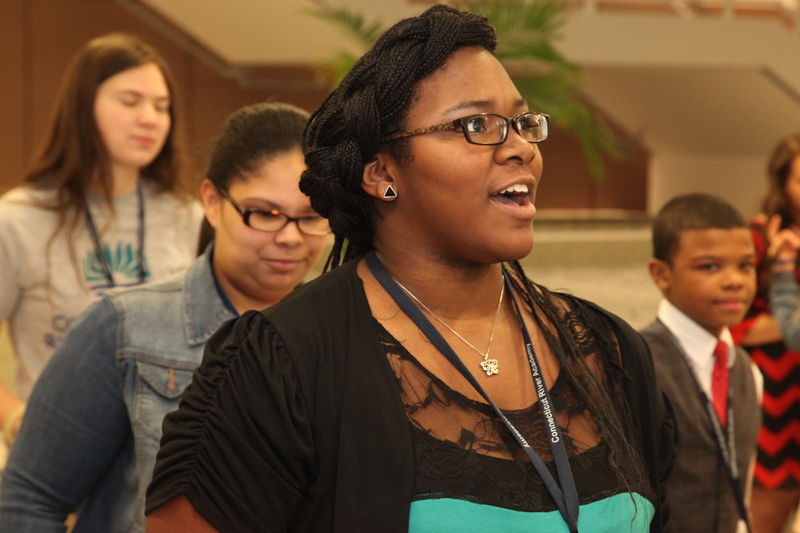 Erica Beavers, a CTRA senior, reacts during the ceremony. Photo courtesy of John Muldoon. East Hartford Mayor Marcia Leclerc wished the students good luck in their new building and said she was happy to have such a facility in her town. “It gives me great pleasure to see 9 Riverside Drive rise from the rubble to what it is today,” Leclerc said. The Academy stands on the site of former brownfields that have been remediated for new use. Other dignitaries who spoke included State Representative Henry Genga, who presented a citation on behalf of East Hartford’s General Assembly delegation as well as the entire state legislature. U.S. Senator Richard Blumenthal and Congressman John Larson were in Washington, but sent their regards and congratulations to the CTRA students and faculty. 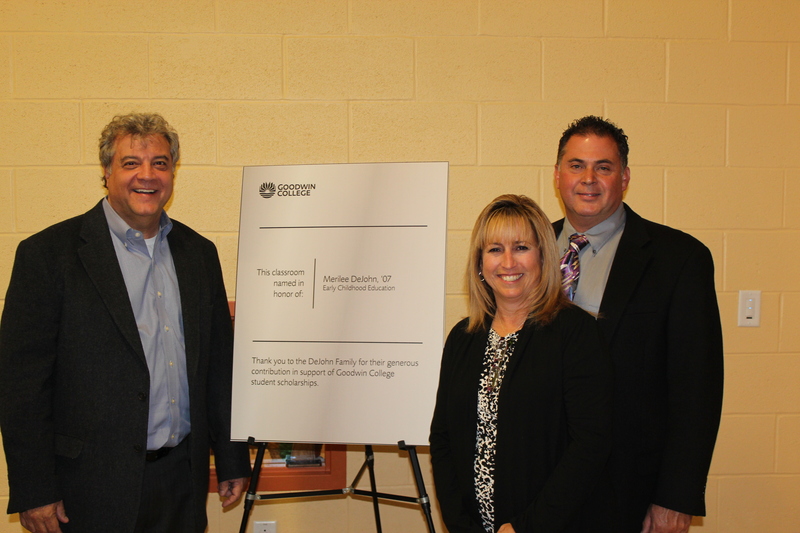 Goodwin College President Mark Scheinberg also extended his good wishes on the students. He called the Academy the best high school in the region even before the building was complete, and now the students have the chance to be the first of many to leave their mark. “There are no words I can say that can possibly describe how it feels to walk into this place,” said Scheinberg. Following the ceremony, students led tours of guests through the facility. Images of the day’s festivities are available for view on Goodwin’s Flickr page. Click here to watch a student-produced video. Video created by CTRA student Hannah Conde for JT Foster’s journalism class. Prospective students interested to learn more are encouraged to visit www.goodwin.edu/Magnet_Schools/CRA/default.asp. A parent informational session is scheduled for Saturday, February 8, at 11 a.m. at the school. RSVP is required; register online at http://www.goodwin.edu/CRA/. The wait is almost over for the students, faculty, and staff at the Connecticut River Academy at Goodwin College, which will cut the ribbon on a brand new facility on Tuesday, January 7. A side view of the new Connecticut River Academy, set to open in January. Goodwin College’s magnet high school is literally rolling out the red carpet in celebration of the $57 million, 105,000-square-feet building, located at 9 Riverside Drive in East Hartford. State and local officials will join the College and the entire high school in celebration of the new building, which has been long anticipated since the Connecticut River Academy opened on campus in 2010. While most of the festivities are specifically students and faculty, the Academy will hold a ribbon-cutting ceremony at 10 a.m. in the gymnasium. The press is welcome to attend the ceremony. On Friday, December 20, the students will spend their last day of class at the incubator space at 167 and 195 Riverside Drive that has served as a temporary location for the Academy. The College’s main building has also provided space, and many Academy students have earned transferable college credits by taking classes at Goodwin. When the school returns from the winter break, they will have a new building waiting for them with a variety of amenities and special features to enhance the environmental studies curriculum. The four-story building is the second largest facility on the Goodwin College River Campus and is almost as large as the College’s flagship building farther down Riverside Drive. The Academy features state-of-the-art labs and equipment, a “green roof” where students can grow plants, a habitat room with live animals, and a project center. 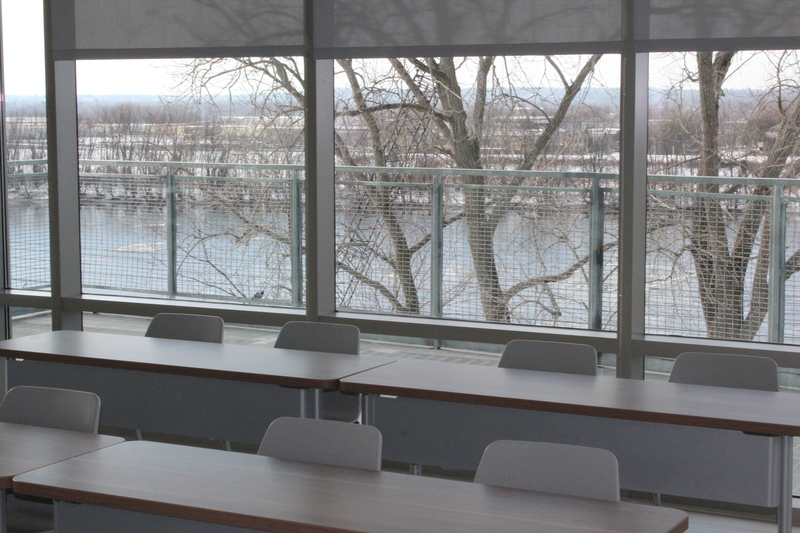 Many of the classrooms in the school feature great views of the Connecticut River.
. In the spring, work will be completed on a floating dock with a research vessel to provide the students with access to the Connecticut River. The College will soon introduce a trolley to provide transportation throughout the various buildings on campus, including the Academy and the main Goodwin building. The Fletcher Thompson architectural firm designed the building and FIP Construction built it. Ground was broken on the facility in January 2011, with Governor Dan Malloy joining several other officials to commemorate the start of construction. Progress has been steady and now the Academy stands prominently along the Route 2 corridor in East Hartford. It is one of three magnet schools to be completed on Goodwin’s campus for the 2013-14 academic year, joining the Goodwin College Early Childhood Magnet School and the pending Pathways Academy of Technology and Design. The latter will open this spring, operated by the Hartford Board of Education in partnership with the College. The gymnasium has capacity for the entire school. 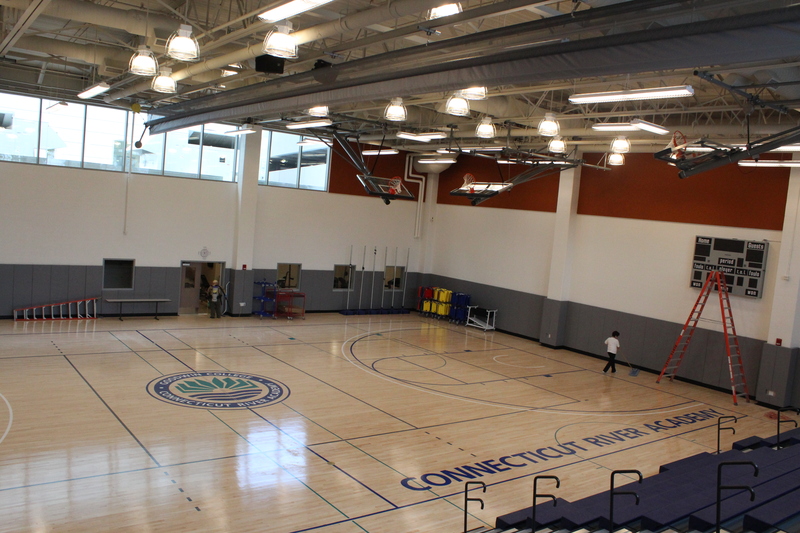 The ribbon-cutting ceremony will take place at center court on January 7. Media is invited to attend the ribbon-cutting ceremony and there will be opportunities afterward to explore the school. All who are interested should contact Matt Engelhardt, Goodwin College Communications Coordinator, at mengelhardt@goodwin.edu. The Connecticut River Academy is hosting two upcoming information sessions for future students and their families. The first is on Saturday, January 4 at 11 a.m., and the second is Tuesday, February 11 at 5 p.m. RSVP is required. All interested can register online at http://www.goodwin.edu/CRA/. More shots of the building are available on our Flickr photo album, which can be accessed here. As a student, alum, and Board of Trustees member, Merilee DeJohn has left a profound mark on Goodwin College. As a result of a generous contribution to the Goodwin College Foundation, a classroom at the new Early Childhood Magnet School now literally bears her name. Goodwin President Mark Scheinberg joins Trustee Merilee DeJohn and her husband Gene. DeJohn, who was valedictorian of the Goodwin College Class of 2007, was honored on Friday, November 8, in a ceremony that left her surprised and humbled. A large crowd of people, including Goodwin alumni, Board members and senior executives, gathered in the Goodwin College Early Childhood Magnet School to celebrate as classroom 134 was dedicated in her honor. “Everything I’ve done has always been about the children and that’s what makes this so special to me,” DeJohn said. Her husband Gene DeJohn worked secretly with the College to make a generous gift and name the classroom after Merilee. Goodwin College invited her to speak at an alumni event for grads of the Early Childhood Education and Child Study programs, without spilling the secret that the unveiling would be the highlight. “We all knew she wouldn’t decline an offer to help the College whenever she could,” Gene DeJohn said as he introduced the surprise. The contribution will help strengthen the Goodwin College Foundation’s endowment, which provides scholarships and other opportunities to students. Given DeJohn’s focus on Early Childhood Education and her role as a teacher, the new magnet school was the ideal setting for a classroom to be named in her honor. Gene DeJohn recalled how Merilee’s experience at Goodwin provided the foundation for a career dedicated to serving children. A former stay-at-home mom, she was inspired to seek a job as a paraprofessional on the advice of a teacher. At the time, Goodwin had recently established an associate degree program in Early Childhood Education and Merilee enrolled in the program. She was 42 years old at the time of her enrollment. DeJohn would graduate in 2007 not only at the top of her cohort, but as the College’s valedictorian. She has since earned bachelor’s degree in education from the University of Hartford and is working toward a Master’s degree in special education from St. Joseph’s University in Pennsylvania. She teaches second grade at Highcrest Elementary School in Wethersfield. 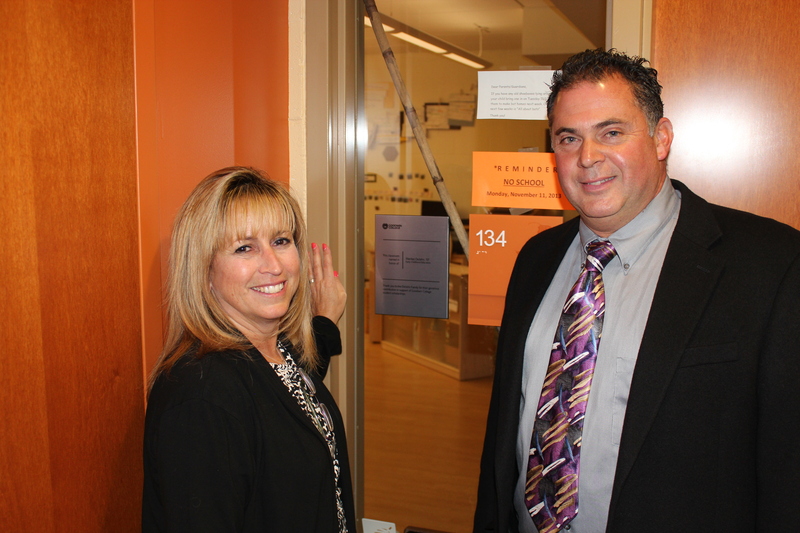 The DeJohns stand outside Classroom 134, which has been dedicated to Merilee. Her ties to Goodwin College have been reinforced through the years. In 2008, DeJohn was named to the College’s Board of Trustees and serves on its Student Affairs subcommittee. She also chairs the Alumni Leadership Committee and is a constant presence at Goodwin events and gatherings. “She is not just my aunt, she’s an inspiration,” said her niece, Christina Sorano, a Goodwin College pre-Nursing student.